Burj Dubai is otherwise called Burj Khalifa, the tallest skyscraper across the globe. This building never missed attracting tourists and visitors every year. To honor the president of the United Arab Emirates and the ruler of Abu Dhabi, Khalifa Bin Zayed Al Nahyan, the building Burj Dubai was renamed to Burj Khalifa. After several stages of planning, designing, the construction of the huge building began in the year of January 2004 and it was officially inaugurated in 2010. The design exactly resembles Islamic architecture. The Burj Khalifa acquired global acclaim and recognition, it contributed towards hyping tourism and infrastructural industries in Dubai. Everyone should visit such an exciting place and the global city Dubai is also a business hub of the Middle East. Dubai itself is the best place for sightseeing and luxury shopping. The Burj Khalifa is with an architectural height of 2716.5 feet and floor height of 1918 feet. The total height of the tallest building measured from its tip is 2723 feet. 12,000 workers worked every day during the peak construction days. The towerâ€™s design resembles the shape of Hymenocallis flower in which its long petals extend out from the center area. The total building cost of Burj Khalifa was $1.5 billion. There are totally 163 floors above the ground and only one floor located in the underground. This building encompasses 58 functional elevators that run at a top speed of 10 meters/second. This building contains 304 hotels, 2957 parking spaces and 900 apartments. The owner of the world wondering tower is Emaar and Skidmore Owings & Merill LLP (SOM) an American architectural and urban planning, engineering firm designed this skyscraper. The Burj Khalifa has its own electrical substation at its 155th floor which is the highest substation in the world. The worldâ€™s highest lounge bar At.Mosphere is on the 122nd floor of this building; people can have a stunning view of the Dubai skyline and the Arabian Gulf from here. The concrete weight of the building is equivalent to 1,00,000 elephants. The total weight of the aluminum used here is equivalent to five A380 aircraft. More than 11,00,000 tons of concrete, 55000 tons of steel rebar and 22 million working hours took to complete the huge building. Burj Khalifa consumes 2,50,000 gallons of water on a daily basis and the electricity consumed in a day is equivalent to 360,000,100 watt bulbs being lit at once. Burj Khalifa has the world highest swimming pool on its 76th floor. The biggest attractive of Burj Khalifa is its observatory deck that is located on the 124th floor. An average of 1,56,000 people visited this wonderful building every month in the year of 2013. November to April is the shopping festival time in Dubai. If you like to visit the place from May to October, it is a less favorable time due to heat and humid climate. It is better to avoid visiting Dubai during Ramadan days because visitors cannot eat, drink and do other activities during the time in the public area. There will be a over rush in Sunset time at Burj Khalifa. 5.30-6.30 PM is the prime time and it is advisable to purchase the sunset tickets at 5.00 PM and you can enjoy a couple of hours at the top. Sunrise tickets are available from 5.30 AM on Friday and Saturday only. The cost of the tickets to visit the observations decks varies from time to time and the charges differ for the adult, children, and infants. The Burj Park sprawls around 29,000 Sqm and is located at the base of Burj Khalifa Tower. It is an adorable place to catch a glimpse of the Dubai Fountains, especially at night; Many specially designed light cubes beautifully glorify the park. 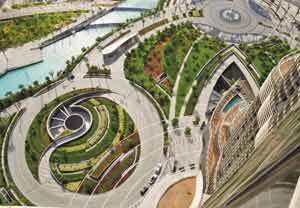 It is a great leisure place in the Burj Dubai downtown; Emaar developed and completed this mega project. There are some restaurants and cafes near the park and many restaurants and cafes are present at Emaar Boulevard. The highlight of the park is it is open for 24 hours and does not have any fencing. Sometimes the park conducts events, product launches, concerts, gala dinners, corporate functions. This park provides the tourist unparalleled views of the Burj Khalifa, the Dubai fountain, the old town etc. This greenery park encompasses ample seating spaces. Play area, Palm count, Grand terrace, Outdoor dining facilities are available here. The Dubai Aquarium and Discovery centre is one of the largest indoor aquariums that is present in the centre of the Dubai Mall. 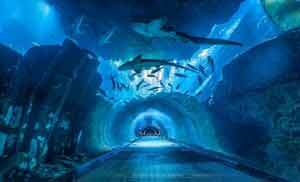 It won the Guinness World Record for being the worldâ€™s â€œLargest Acrylic Panelâ€ which is larger than the Japan’s Okinawa Churaumi Aquarium. The Dubai Aquarium & Underwater Zoo illuminates ocean floor, showcases more than 33,000 aquatic animals and represents more than 220 species. This multi-purpose venue of the mall uses refrigeration plant technology and hosts at least 2000 guests. It provides more than 1800 pairs of skates from Italy manufacturers to suit children and adults of all age groups and sizes. The Dubai Ice Rink offers birthday party packages, Public Skating Sessions, learn-to-skate packages, and exclusive venue hire for corporate functions. Apart from these, it also comprises an in-house cafÃ©, the skate shop, and a giant LED screen. There are a number of luxury restaurants, hotel, spas, and lodging centres in and around the Burj Khalifa. The tourists may book the accommodation in advance to avoid the eleventh-hour rush.